Most frequent problems that happen with fonts are about the font family organization, in other words about the way in which fonts are grouped and named in application user interfaces. Principally, there are two ways of grouping fonts in application user interfaces; by typographic families or by styling groups. Because of this fact, most font formats require special care when you set their font menu names and provide information in which fonts are used as “italic” or “bold” variants of other fonts. TransType 4 provides brand-new convenient and completely automatic ways for you to easily define the menu naming and grouping for many fonts at a time. 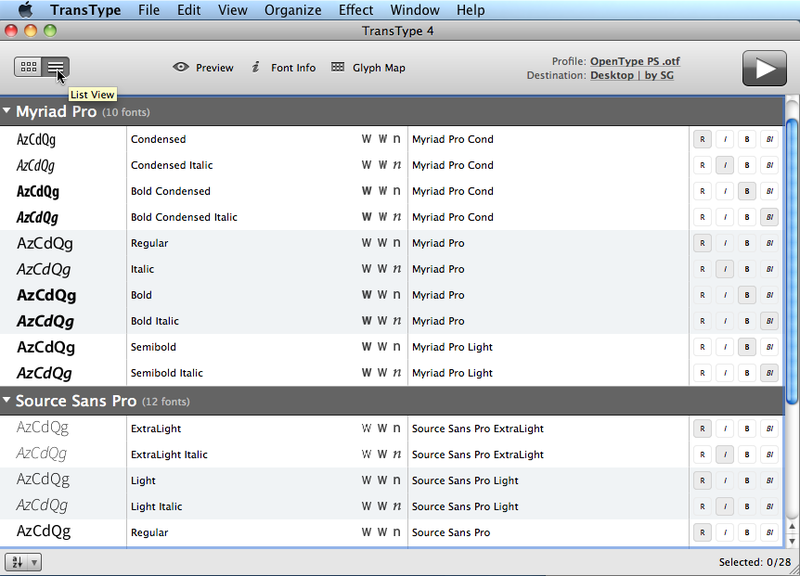 TrT can automatically generate family naming and styling links for most fonts. In some cases, you will need to make some minor changes or edits, but in most cases, TransType will do its job automatically. A typographic family (or just: family) is a series of fonts that are listed under the same family name in applications which allow a family with an arbitrary number of fonts. This is typically the case in Mac OS X applications and in Adobe applications, as well as some newest Windows applications. Illustration: typographic family name and typographic style name as seen in Mac OS X or Adobe applications. All fonts within a family must share the same Typographic family name (TFN), and each font must have a unique Typographic style name (TSN) within that family. It’s also recommended (but not required) that each font within a family has a unique combination of the Weight, Width and Slope parameters. The Typographic family name (TFN or just “Family”) is the name under which all fonts from one family are grouped in the font menu of a modern application. It is sometimes called “Preferred family name”. The font vendor, or the user creating the font, needs to set the TFN for the family. In most existing fonts, this information is already set correctly, but you may want to change the TFN if you’re creating a custom version of a font family, or if you’re converting the family into a different format. Most operating systems fail miserably if you install fonts which have the same TFN but come in different formats. character set, in OpenType fonts e.g. “Pro”, “Com”, “Std”, “W1G”, “WGL”, “World”, etc. ; in Type 1 fonts e.g. “CE” for Central European,“Cyr” for Cyrillic, “Gr” for Greek, “Heb” for Hebrew, “BA” for Baltic, “Tur” for Turkish, etc. ; sometimes, this parameter is appended to the TSN rather than TFN. The Typographic family name may contain spaces but some vendors choose not to use any spaces here. The Typographic family name must be identical in all fonts that should appear as one family in the font menu of modern applications. The length of the Typographic family name is limited to no more than 31 characters. It is recommended to only use uppercase and lowercase English letters, spaces and numerals. Usage of non-English letters, special characters such as underscores, ampersands, etc. is strongly discouraged. TransType can automatically build the Typographic family names for selected fonts if you choose one of the family-related entries of the Organize menu (Families from Styling Group, Families from PostScript Name, Separate Families, Merge Families). The design parameters of a font describe typographic properties of the underlying typeface. They are declared by the font vendor. The three important parameters are: Weight, Width and Slope. The Weight describes the typographic weight (stroke thickness) of a typeface, ranging from Thin to Extra Black, and defaulting to Regular. We recommend to set this parameter to a value which truly reflects the typographic weight of each font. Alternatively, if a family consists of a single font, you may set the Weight parameter to Regular, and if a family consists of just two weights, you may set the Weight parameter to Regular for the lighter weight, and to Bold for the bolder weight. This parameter is additionally expressed using a number — from 100 for Thin to 950 for Extra Black. In TransType’s Icon view, the numerical Weight is shown at the bottom of each font’s sample. The Width describes the typographic width of a typeface, ranging from Ultra Condensed to Ultra Expanded, and defaulting to Normal for most fonts. You should set this parameter to a value which truly reflects the typographic width of the typeface. The Slope describes whether the font acts as an upright or italic font. Most fonts (including true upright fonts and also script fonts which are cursive) should have a Plain slope. You should set the Slope to Italic only if a font should act as an italic companion to a upright font. Advanced users may set the Slope to Oblique instead of Italic. The typographic style name (TSN or just “Style”) is the name under which a certain font within a family appears in the font menu of modern applications. It is sometimes called “Preferred style name”. The Typographic style name typically describes the typographic properties of the font within the typographic family. The specific information contained here varies depending on the convention used by different font vendors. Usually, it consists of a combination of keywords, which describe the design parameters (Weight, Width and Slope). If the Width is Normal or the Slope is Plain, no keyword is used. For example, if a font’s Weight is defined as Black, its Width is defined as Condensed and its Slope is defined as Plain, then the Typographic style name would typically be “Black Condensed” or “Black Cond” or “Cond Black”. The Typographic style name may contain spaces but some vendors choose not to use any spaces here. The TSN must be unique for each font with the same Typographic family name. TransType will automatically build a good Typographic style name if you change any of the font’s design parameters. 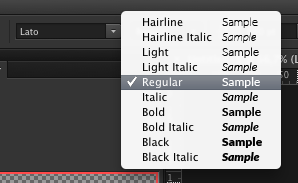 TransType will also build good style names for selected fonts if you choose Organize / Build Style Names. A styling group is a series of fonts that are listed under the same “Font” name in older Windows applications. Such applications typically allow you to select the fonts within a styling group through a combination of two toggle buttons: bold (typically labeled with a bold “B”) and italic (typically labeled with an italic “I”). Either button can be on or off, which results in four possible combinations — which leads to the limitation that no more than four fonts can exist within one styling group. Inside a font file, this information is expressed using the styling group name (SGN), the styling link value (SLV) and the styling link name (SLN). 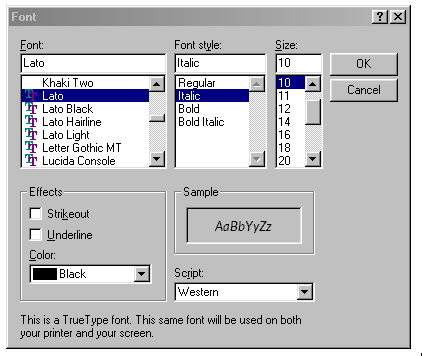 Illustration: Font selection dialog box in Windows 98. The “Font” list shows the styling group name, while the “Font style” box shows the styling link name. All fonts that are associated with each other through styling links form a styling group. The Styling group name (SGN) is the name that appears in older Windows applications as the “Family” or “Font” name. It is sometimes called “Windows family name” or “Microsoft menu name”. The typographic family must be divided into styling groups, each having no more than four members which all must be connected by styling links with each other. Each styling group within a typographic family must have a unique SGN. The length of the SGN is limited to no more than 31 characters. It is recommended to only use uppercase and lowercase English letters, spaces and numerals. Usage of non-English letters, special characters such as underscores, ampersands, etc. is strongly discouraged. TransType will build good Styling group names for selected fonts if you choose Organize / Build Styling Group Names. Within one typographic family, there must be exactly one default styling group, which must have the Styling group name identical to the Typographic family name. TransType can automatically generate good Styling group names for the remaining styling groups by combining the Typographic family name and Typographic style name (separated by a space) of the font which is the Regular font within a styling group. If a font’s Typographic style name is very long, TransType will build the Styling group name by automatically shortening certain words within the TSN, using a convention widely accepted by various font vendors. The Styling link value (SLV) is the information that links a font within a styling group to a certain combination of the “B” and “I” buttons. This information is used in all applications on all operating systems. The Styling link name (SLN) is the name which appears as the name of the “Font style” in a font selection menu in applications that do not support Typographic families. 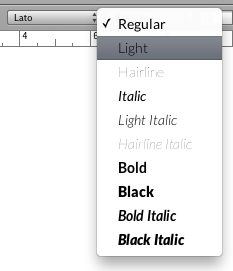 Only the following names are permitted for the styling link name: “Regular”, “Italic”, “Bold”, “Bold Italic”. Since the Styling link name and the Styling link value are two ways to express the same information, TransType 4 allows you to make sure that these values are set correctly. If your styling group has only one font, its SLV should always be Regular. If your styling group has two fonts, their SLV should be Regular and Italic or Regular and Bold. A Bold Italic SLV is only permitted if your styling group has three or four fonts! TransType will automatically build Styling links if you use one of the styling entries from the Organize menu (Optimal styling, Italic styling, Separate styling). There is a number of font names that are used to identify a font in a unique way. No two fonts installed on the system or used within one printing job should have the same unique font names. The Full font name (FFN, or just “Full name”) is the field which is sometimes used by applications to refer to a font by its name (for example when storing information about fonts used in a document), and is sometimes displayed to the user (mostly by font viewing or managing applications). Its length cannot exceed 31 characters. Typically, the FFN consists of the Typographic family name and the Typographic style name, separated by a space. TransType will automatically build a correct Full font name whenever you change the Typographic family name or the Typographic style name. If the Typographic style name is very long, TransType will build the style name part of the Full font name by automatically shortening certain words using a convention widely accepted by various font vendors. The PostScript name (PSN) is a name used internally by a PostScript printer to identify the font within a printing job. Its length cannot exceed 29 characters, and it must only consist of uppercase or lowercase English letters or digits. In addition, one hyphen is used to separate the family name part from the style name part. The family name part and the style name part are derived from Typographic family name and TSN, but spaces are eliminated. TransType will automatically build a correct PostScript name whenever you change the Typographic family name or the Typographic style name. If the Typographic style name is very long, TransType will build the style name part of the PostScript name by automatically shortening certain words using a convention widely accepted by various font vendors. select fonts and run various operations. The Icon view visualizes how your fonts are grouped into families and styling groups. It allows you to quickly rearrange the fonts into different styling groups or families, or change the fonts’ design parameters. You can also double-click on any text field and edit its contents in-place. This way, changing the family name for all fonts in a family is possible within just a few seconds. The List view is a more compact representation of your fonts. Here, you can easily look at many fonts at a time; change the fonts’ design parameters; edit their most important names and styling links; and sort the fonts within a family either by style or by styling group. Illustration: the Main area in Icon view. Illustration: the Main area in List view. 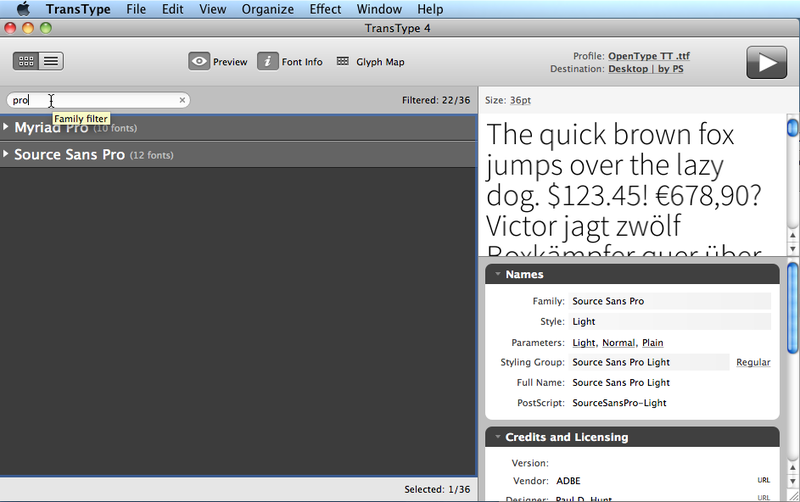 Find only searches fonts by their Typographic family name. “Find” changes the meaning of “All” in “Convert All”, “Select All” or operations in the Tools menu — when Find is enabled, “All” means “all visible”. The Main area toolbar is located at the bottom of the main area. In the Icon view, the toolbar includes only the total and selected number of fonts. 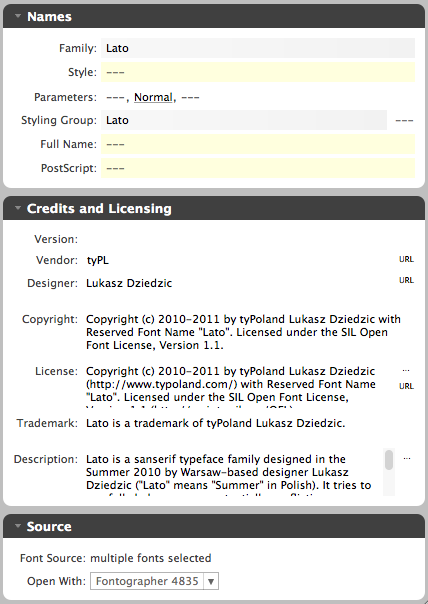 Sort by Styling Group — fonts within each family are listed sorted by their styling group name (SGN). Your principal activity while preparing a conversion (after adding sources and before running the conversion) is customization and rearrangement of the targets — in particular rearrangement of families and styling groups. For that, you use the Main area (where you can perform text editing and drag-and-drop operations) and optionally also the Font Info panel. On top of that, some special operations are available from the Organize menu. The most important and most common operations can be done in the Main area alone. 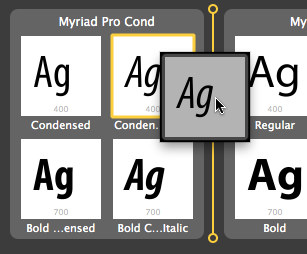 Each Typographic family in the Icon view has its own area, which you can expand and collapse. Within each Typographic family, each Styling group is represented by a rectangle. The Styling group name is visible on the top of the rectangle. Inside the rectangle, there are four slots for the Styling link values: Regular, Italic, Bold and Bold italic. Below each slot, the Typographic style name is shown. drag-and-drop to move or copy target fonts between styling groups or into special drop targets to create a new styling group or new family. You can select one or more single targets (from the same or different Families or Styling groups). The icon view uses the concept of “active areas”. A click (or a Shift-click) onto an active area may add the appropriate object (target item or styling group) to the selection or remove it from the selection. Clicking on the target area (the sample or the Typographic style name) selects that target. Clicking on the styling group area (the space within the styling group rectangle which is not the target selection area) selects the styling group and all its targets). 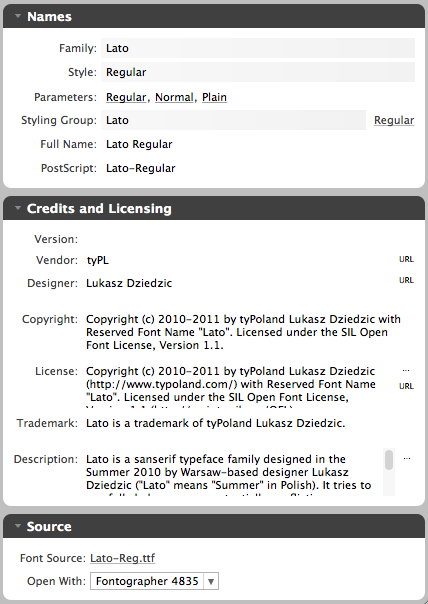 Clicking on the Typographic family name area selects all styling groups in that family, i.e. selects the whole family. Right-clicking performs selection the same way as left-clicking but also reveals a context menu. Shift-clicking on an area adds it to the current selection or removes it from the selection. If some target items are selected, you can also use Edit / Select Styling Group to select the entire Styling group for each selected target, or Edit / Select Family to select the entire Typographic family for each selected target. The typographic family name (in the dark bar / family area), the Styling group name (on top of each styling group’s rectangle) and the typographic style name (below each sample) are editable in-place. To edit a name, just double-click on it. Regular drag-and-drop constitutes “move” (i.e. Cut/Paste), but with the Alt/Option modifier key, you can also “duplicate” (i.e. Copy/Paste) targets. A single target can be dropped onto an empty target area within a Styling group. Multiple targets can be dropped into the space between two styling groups (vertical or horizontal space). New Styling groups are created to incorporate the dropped targets. When the Alt/Option key is held while dragging then a “+” sign appears and the dropped targets are not moved but copied (duplicated). This way you can duplicate a target (which will keep the same source) and then place them in multiple Styling groups or Families. A Styling group can also be duplicated in the same way. Illustration: Selection of single targets or styling groups. Illustration: drag-and-drop visualization for Styling groups. Remember: If your Styling group has only one font, its Styling link value should always be Regular. If your Styling group has two fonts, their SLV should be Regular and Italic or Regular and Bold. A Bold Italic SLV is only permitted if your styling group has three or four fonts! Illustration: Detail of List view with one target item selected. The renaming and rearrangement of targets in the List view can be performed using text editing (in-place in the Main area or in the Font Info panel). Drag-and-drop technique doesn’t work here. Single or multiple items can be selected. Using the Shift modifier key selects a continuous range, and the Cmd/Ctrl modifier selects additional single items — just like with normal OS file selection in Finder/Explorer. Clicking on the Family area selects all Styling groups in that Family. The Typographic family name, the Typographic style name and the Styling group name entries are editable in-place. Use Weight, Width and Slope pop-up menus to change the font’s design parameters. Also, the R, I, B, BI icons are clickable (mutually exclusive, they set the Styling link value). TransType 4 includes a series of automatic operations which allow you to very quickly rebuild or rearrange the font menu naming and family organization. All these operations work on the fonts which you select in the Main area. Typically, you’d want to select one family at a time before running one of the automatic operations. All these operations are accessible from the Organize menu. Copies the existing Styling group names to Typographic family names, and copies the existing Styling link names to Typographic style names. This results in fonts which will have identical menu names in all applications (both modern applications such as those on Mac OS X or by Adobe, and on old Windows applications). Useful if you want 100% cross-platform compatibility for your naming. Note, however, that each such family will have no more than four styles, and that all styles will have names “Regular”, “Italic”, “Bold” or “Bold Italic”. So the “typographic finesse” of the family naming will be lost. Uses the PostScript names to build the typographic family names and typographic style names. Useful primarily if your source fonts are old Mac Type 1 or Windows Type 1 fonts. Since the PostScript names don’t use spaces, you may need additional editing to “prettify” the Typographic family and style names. Places each font into a separate family. The Full font name is used as the Typographic family name, and “Regular” is used as the Typographic style name. Useful if your font family is incomplete, i.e. if it lacks certain basic styles. 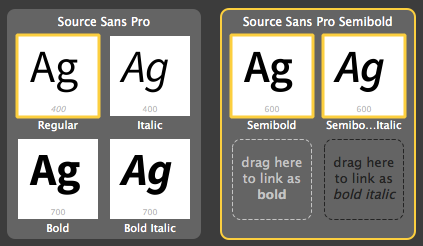 Also useful when creating CSS-compatible webfonts. Tries to place all selected fonts into one family. This is a complex operation — TransType will attempt to rebuild the Typographic style name for each font using the design parameters declared in the fonts. TransType will also attempt to resolve some naming conflicts, and will automatically place fonts into styling groups. May require additional manual editing. Builds good Styling group names for the selected targets based on the Typographic family name and the Typographic style name of the regular style within each Styling group. Useful if you changed the Typographic family or style names. The most “magical” operation: attempts to build optimal styling groups within the families in which the selected fonts reside. TransType will analyze the various design parameters declared in the fonts; find fonts which match; and produce styling groups in which most fonts will be linked to their italic counterparts, while the fonts with the regular (numeric 400) and bold (700) Weight will also be linked together. Useful if some fonts from your family are not accessible in some applications, particularly in Microsoft Office on Windows or Mac OS X, or in other Windows applications. Attempts to build styling groups by linking fonts with their matching italic counterparts. Does not link fonts across different weights, otherwise similar to Optimal Styling. Useful if you definitely want all weights of a family to appear as single “families” in older Windows applications. 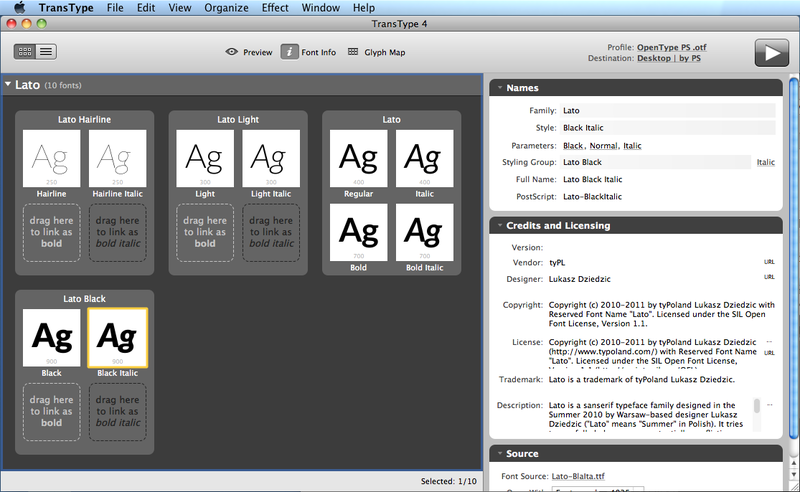 Places each font within a family into a separate styling group and sets each font’s Styling link value to Regular. Another “magical” operation: analyzes the design parameters declared in the fonts (Weight, Width, Slope) and automatically builds good Typographic style names. It builds the TSNs using naming conventions adopted by many vendors. Each font contains a set of important entries (“Font info” or “font metadata”). TransType 4 allows you to view some of that Font Info, and, in some cases, edit it. Illustration: TransType 4 UI with Font Info panel visible on the right. Open With: : list of applications which can open the original (source) font file; choose to open the source font in the desired application. When multiple targets are selected, field with different values get a color (yellow) and textual (“—”) indication for “multiple values”. They’re not editable. The fields with identical values display the identical values and remain editable if they’re supposed to. 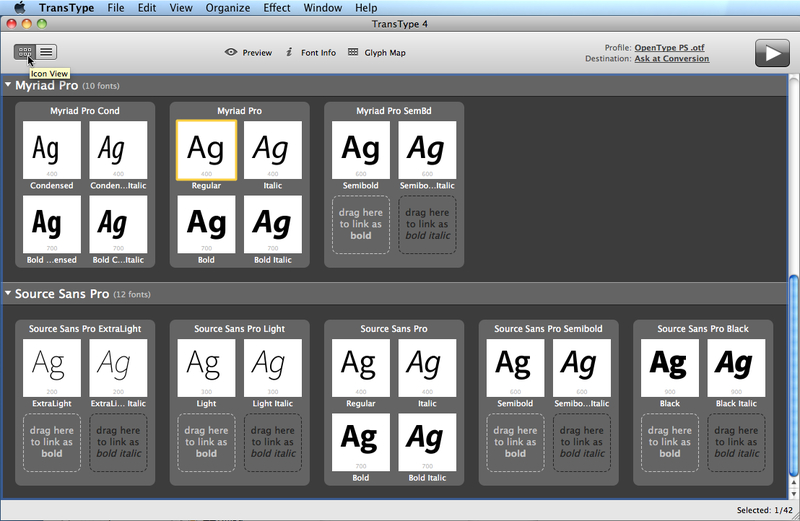 Illustration: Comparison of the Font Info panel when one or multiple fonts within a styling group are selected. Copyright © 2013-2015 by Fontlab Ltd.